Cafe 'de Ceuvel' - Stout & Co.Stout & Co.
De Ceuvel is a planned workplace for creative and social enterprises adjacent to the van Hasselt kanaal off the river IJ in Amsterdam North. 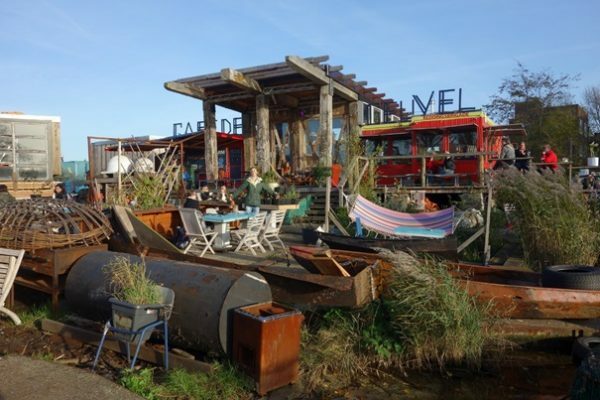 The land was secured for a 10-year lease from the Municipality of Amsterdam after a group of initiators won a tender to turn the site into a regenerative urban oasis. The former industrial plot will be turned into the most unique and sustainable urban developments in Europe. The site, which is now heavily polluted, will feature imaginatively retrofitted houseboats placed around a winding bamboo walkway and surrounded by an undulating landscape of soil-cleaning plants. Each of the upgraded boats will house offices, ateliers, or workshops for creative and social enterprises. The plan also includes a public restaurant, Ceuvel Café, and a bed & breakfast. The De Ceuvel project is realised by one of the Stout&Co owners at DELVA Landscape Architects.